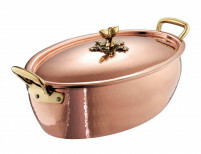 RUFFONI COOKWARE – HISTORIA DÉCOR COLLECTION – This is a truly magnificent collection from the famous Italian Copperware Company Ruffoni. Each piece is startlingly beautiful. 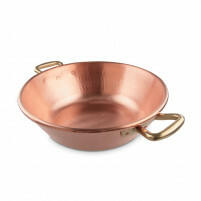 This collection has been fabricated using the highest grade of copper in order to comply with the worldwide FDA lead and cadmium regulations. 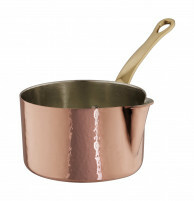 Copper is an excellent heat conductor cooking at a low temperature which reduces the risk of overheating so you will not burn your food nor damage your pan. 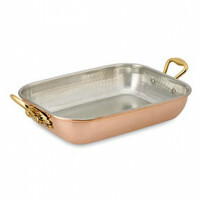 Each piece is hand hammered to a thickness of 1.5mm to 2.00 mm plus each pan has a tinned interior which is also hand hammered. It is also bacteria resistant. The Historia Décor Collection comprises of a Fish Kettle, Polenta Pot, Chef Pan, Au Gratin Oval Pan, Saucepan, 8-piece set in a Wooden Box, Stockpot, Paella Pan, Braiser, Frying Pan, 5-piece set in Wooden Box, a separate lid, 3 litre Saucepan and Risotto Pan. 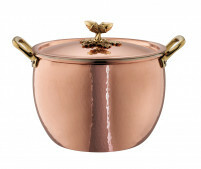 The handles are of solid brass and decorating the lids is a cluster of solid brass acorns with oak leaves. This collection is superb. Buy from our ONLINE SHOP where we guarantee you a very reasonable price plus ONLINE support and advice.